The circadian rhythm of pineal melatonin is the best marker of internal time under low ambient light levels. The endogenous MELATONIN rhythm exhibits a close association with the endogenous circadian component of the sleep propensity rhythm. This has led to the idea that melatonin is an internal sleep “facilitator” in humans, and therefore, useful in the treatment of insomnia and the readjustment of circadian rhythms. There is evidence that administration of melatonin is able to induce sleep when the homeostatic drive to sleep is insufficient, to inhibit the drive for wakefulness emanating from the circadian pacemaker and to induce phase shifts in the circadian clock such that the circadian phase of increased sleep propensity occurs at a new, desired time. Therefore, exogenous melatonin can act as soporific agent, a chronohypnotic, and/or a chronobiotic. The hormone can be used as a sleep aid and in the treatment of some sleep disorders Melatonin is known to aid in reducing the effects of jet lag, especially in eastward travel, by promoting the necessary re-set of the body’s sleep-wake phase. 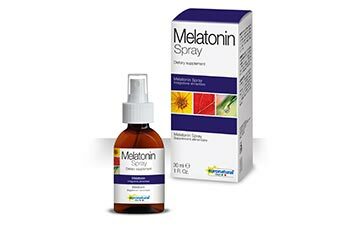 Take 2 spray directly into your mouth about an hour before going to bed.